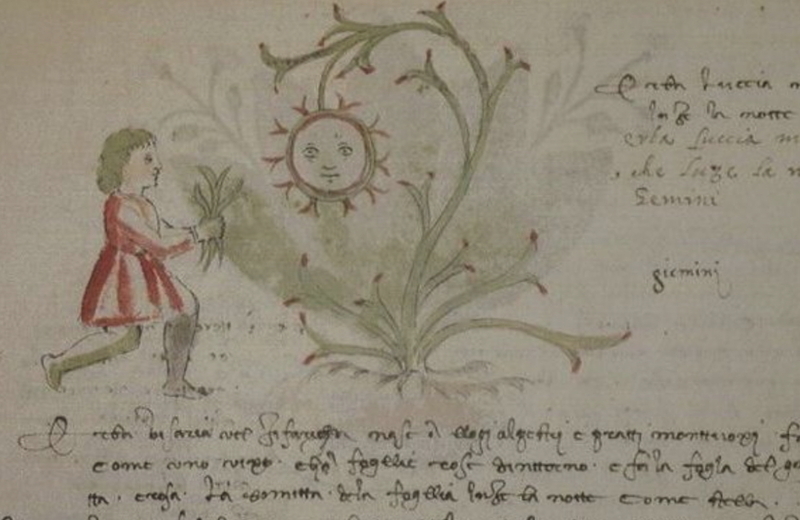 This illustrated herbal was written in Veneto in 1450 ca. Digital images can be seen You are not allowed to view links. Register or Login to view.. The ms was stolen in 1992 and recovered in 1995, but the thieves removed 6 folios that are now lost (documented in older black-and-white photographs). A facsimile edition was published in 2007 (You are not allowed to view links. Register or Login to view., Editors: Caterina Barbon and Roberto Benedetti, Publisher Vattori). The essays in the 2007 book only briefly discuss the relationship between this herbal and You are not allowed to view links. Register or Login to view.. A paper and a thesis by Micol Duca are mentioned: her hypothesis is that the Vermont and Udine herbals are both copies of a lost original written in Tuscany. Roberto Benedetti also points out some errors in the text of the Udine herbal that do not appear in the text of the Vermont herbal. Comparing the illustrations, it is clear that those in the Udine herbal are more detailed and more accurately painted than those in the Vermont herbal. For instance, in Vermont img.22 “Herba Imorio Chiarissima” has two large green leaves; these leaves were color-annotated “rossa” (red). The corresponding illustration in the Udine herbal (img.56) has two large blossoms or fruits, painted red and with a “scaly” pattern that was also lost in the Vermont ms. When comparing this herbal with the Voynich ms, a feature that seems common to both is the use of roots with only a few large “branches” which are arranged in such a way that they suggest a vaguely anthropomorphic shape. The same roots can also be observed in the Vermont herbal (sometimes obfuscated by the heavier painting). Notice how the first word Erba is written. I like this handwritten ms.
(11-05-2017, 03:34 PM)Davidsch Wrote: You are not allowed to view links. Register or Login to view. Notice how the first word Erba is written. I like this handwritten ms. I am glad you like it, David! The script is described as "Venetian merchant" (mercantesca Veneta). I find it harder to read than the Vermont herbal (also because the scans are of lower quality) but the 2007 book includes a full transcription. Quote: ... but the 2007 book includes a full transcription. Does this mean you have a transcription, or part of it? I'm very interested in that !!!! "Vengono qui proposte la riproduzione fotografica dell’intero codice, la trascrizione annotata e uno studio lessicale." If they could offer a digital transcription of the original text (not modernized Italian) then perhaps 180 EUR is a reasonable price. However if it is a badly typed version, sometime it is impossible to OCR it. Great stuff, Marco, and the drawing style of the roots really is very similar. Where do these new interesting herbals keep coming from? Also, all libraries should be made to implement this reader, it's awesome. (11-05-2017, 08:17 PM)Koen Gh Wrote: You are not allowed to view links. Register or Login to view. Also, all libraries should be made to implement this reader, it's awesome. It's pretty good, but moves back if you try to go to the edges (annoying) and keeps popping up the message that it includes full screen mode every time the cursor moves (might not do it on all browsers, but VERY distracting). I think the British Library reader is good, it's responsive and one can see the edges well, it's too bad it lacks thumbnails. Study of the Udine ms was the final item in a growing number, which altogether convinced me that (quite apart from where the content came from) the Vms was produced in the corridor between England, northern France and the Veneto c.1427-8. Between the Udine and the Vms we have similar forms, but dissimilar style, set iconographic habits and cultural attitudes - all of which suggests the Udine the result of access to an earlier source closer to the Vms and in that northern region. I've opted for the library of Padua university as holding the material by the early fifteenth century - as you may know. Dating the Vms' manufacture to c.1427-28 isn't due to iconography so much as codicology. (just btw). Thanks for the detailed comparisons - well worth citing.